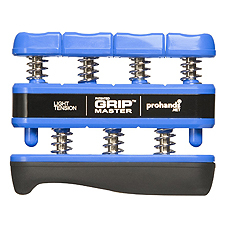 The Gripmaster Hand Exerciser is both soft and strong. It consists of soft and flexible hands enhancing a fluid swing combined with powerful wrist action contributing important additional power to the swing. The patented Gripmaster Hand Exerciser is the only hand exerciser available today which enables you to isolate and develop each finger individually.